This post is about how to teach a dog the drop command. For a general overview on how to deal with a dog’s possessiveness, see my post on how to stop a dog’s aggression around food and toys. Teaching a dog to drop can prevent possessiveness, but it can also help to stop a dog’s existing possessiveness. By possessiveness, I mean the dog is holding or guarding an item while not allowing a human (or another dog) to take it away. 1. Take items away from your dog and reward. 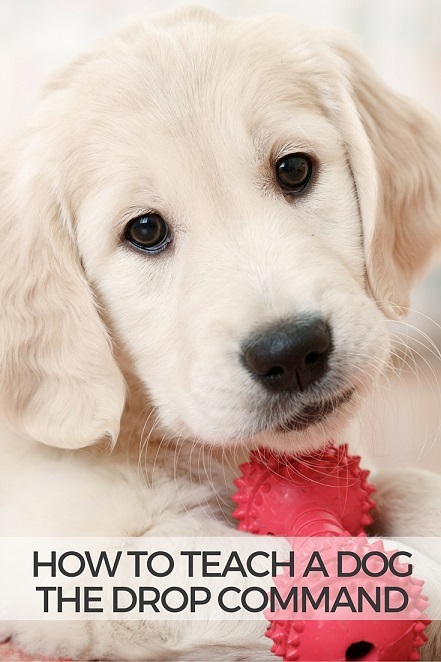 If your puppy or dog will already allow you to take items from her mouth, that is good news! You should encourage this good behavior by continuing to take items from your pup, but make sure to instantly reward her. For example, take a sock from her mouth and instantly give her a piece of chicken. Or, take her raw hide from her mouth and instantly give the rawhide right back. Practice this two or three times in a row at least once a day. Keep all training to short, fun sessions. 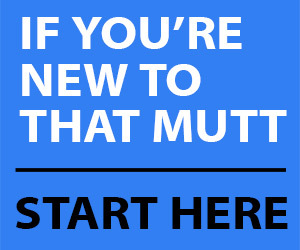 Since your puppy is already willing to give up items in exchange for a reward, add a command. Example: Your puppy has a tennis ball in her mouth. You show her a piece of chicken and say “drop.” She drops the ball. You give her the chicken. Repeat this a few times – enough so it’s fun and your dog remains interested. Quit before your dog starts to get bored or stressed. Make sure to practice this exercise at least a few times per week, preferably every day. Work up to the point where your dog will drop toys on command 99 percent of the time in exchange for a reward. You want to work up to the point where the dog’s response is automatic. 3. Incorporate play into the training. By keeping the training fun and playful, you are removing any tension. Tension can bring out a dog’s possessiveness, so don’t get angry or nervous. 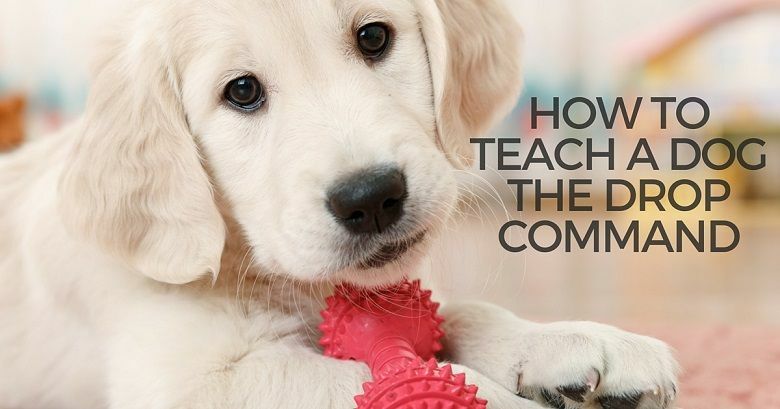 Once your pup already knows the drop command, it’s easy to incorporate the command into games like fetch and tug. This will be an added challenge to your pup because she will be in an energized state of mind. When a dog is excited, it becomes more difficult for her to respond to commands. During play, simply give the dog the drop command and then instantly reward her like you normally would. Some dogs will have difficulty dropping a toy on command in the middle of a game of tug, so start out by using highly valued treats – hotdogs, hamburger, etc. 4. Decrease the food rewards. Once your dog will drop a toy on command 99 percent of the time in exchange for food, then slowly stop giving a food reward every single time. With all commands, you want to work up to the point where the dog will obey 99 percent of the time with or without a treat. Most of us make the mistake of moving on with training too quickly. You really want to work on the basics so your dog will drop a toy 99 percent of the time at home with minimal distractions. Then, start adding extra challenges. For example, start practicing the drop command outside on the grass. Practice the command in every room of the house, on different floor surfaces. Make sure every family member practices the command with the dog. Practice the command with another dog in the room. Practice with “ultimate” items. For example, if you bring home a raw meaty bone for your dog, ask her to drop the bone and then instantly give it right back. What if my dog is already showing aggression? If your dog has already started showing signs of aggression around food or toys, you can still use the above examples. It’s just going to take more time and patience. Please do not hesitate to contact a local trainer for help. 1. Avoid the items most likely to trigger the possessiveness. Try to avoid the items that trigger your dog’s possessiveness for now. For example, if she becomes aggressive when you try to take away a rawhide, then don’t give her rawhides quite yet. Instead, give her less-valued items and trade her for something better. Maybe this means giving her a tennis ball and then rewarding her with a piece of jerky when she drops the ball. Maybe it means she gets a piece of food for dropping a squeaky toy or a stick or a sock. Start with whatever seems easy for you and your dog. 2. Avoid areas of the house that seem to trigger the possessiveness. Some dogs are more likely to become possessive in the kitchen where food is prepared or near the food bowls. Some dogs become more possessive near their kennels or dog beds. If this seems to be the case with your dog, avoid those areas of the house for now. Practice in more neutral areas. If your dog’s possessiveness is triggered by other dogs, then put away all the toys and food when other dogs are around. 3. Don’t worry about using a command right away. Don’t worry about using an actual command quite yet. Sometimes using a command adds extra stress and tension to the training because the owner thinks if he gives a command then he must enforce it. For now, just practice giving your dog something awesome in exchange for the boring item she already has. Do this in short, fun sessions several times per day. 4. Add the drop command once your dog is already dropping the items. Once your dog is already dropping boring items in exchange for highly valued treats, start adding the drop command. Before you progress to more difficult items, work up to the point where dropping the boring items on command is almost automatic for your dog. As described above, try to keep all sessions fun and playful. This takes away the tension and decreases the likelihood of triggering the dog’s possessiveness. 5. Practice many short sessions several times per day. You will see progress faster if you work on the training every day. Keep the sessions very short and fun, and set your dog up for success. 6. Slowly increase the challenges/distractions. When your dog is successful with easier challenges, start raising the bar a bit. 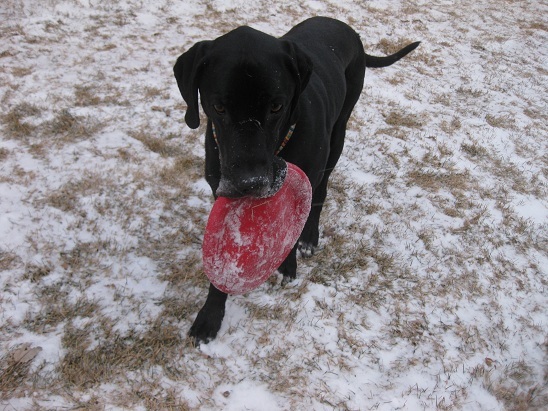 Begin working with your dog to drop more challenging items – bones, rawhides, etc. Begin practicing with other dogs around and in different areas of the house. You want to set your dog up for success, so don’t challenge her too much. It’s OK if you make mistakes and expect too much from your dog. Then you know you need to go back and work on the easier steps a big more. Have you taught your dog the drop command? Good article, teaching your dog to drop whatever they have is good for them, good for you and good for your stuff. Ha! That’s so funny! Your command seems to work just fine, though. We do that as well. It could be that the dogs are just niffing something that we don’t want them to have, or to stop them licking something undesirable. It also works when we say “that’s (the name of us/the other dog), for example Twiz didn’t eat her biscuit one day, dropping it into her bed and disappeared. Odin put his nose in her bed and picked it up. Luckily I saw him and said “that’s Twizzles”, he promptly dropped the biscuit. It doesn’t come anywhere near to chews/bones etc – unfortunately he guards those sort of recourses. I don’t think we’ve ever bothered with the drop command. But my dogs aren’t possessive. Well, Flash gets all growly when people go into the kitchen, and he guards his food bowl, but that same person could walk over and take the food and Flash wouldn’t do anything. He’s a weird dog. Would these techniques work as well with a dog who is toy possessive only with other dogs.. Or what technique would you recommend to help so my dog isn’t toy possessive when other dogs want to play with toys that she believes are her.. We want to adopt a dog who seems to only be possessive with other dogs, how can we make it so she knows that other dogs can play with her toys without having a confrontation/fight. I recommend practicing all these things without other dogs around first, and then adding the distractions of other dogs. You may want to consider hiring a trainer to help you and your dog. My Lexie got into the trash yesterday and ended up with a mouth full of plastic bag. I tried the drop command, but she refused. My only option was to forcibly remove it before she swallowed it. I tried to pry open her mouth with one hand and pull out the plastic with the other. She ended up clamping down and breaking the skin right below my fingernail. Last week I had to pull a dead bird out of her mouth…piece by piece. That was gross! What do you recommend when what is being offered as a reward for drop it isn’t as enticing as what is already in the mouth? I’d much rather she drop what she’s got than forcing me to remove it. my girls have a hard time with this if it is food or toys. my oldest was good but she is now deaf. the 2 younger girls i have to say uh uh, no. they try to take the oldest gal’s treats and food. they know better so i have to watch. the middle child will not drop food, she holds on to it for dear life. she holds it with her teeth clutched tight. i have to open her mouth to remove it. the baby, now 6 almost 7 will sometimes drop it. this is something i really need to work on. i use the drop it command and point down to the ground. My rescue dog will not relieve himself in our yard where we want him to. He holds it for hours and usually waits until I take him for a walk. Sometimes he goes in our yard but not often. I have tried taking him out and if he doesnt go, I take him in and put him in his kennel. I did this several times this morning and was in our yard 2 1/2 hrs. I gave up and we went for a walk when he went. I have tried pee posts, sprays, and even catching and pouring his own urine on our yard. We live in Wisconsin and I cannot be doing this come winter. Help!!! We got stuck at #4. My very smart lab/border collie now steals things in order to “trade” for a treat. You can stand there and say “drop” and see her laugh at you with her eyes. So we’ve effectively trained her to steal for treats. I think there must be a better way. At least she has a soft mouth (unless it’s paper – then all bets are off). Our guy will only drop for a specific ball and once he’s traded for it there’s no getting it back until he’s bored.